Handwriting takes practice. Kids need to learn the correct way to format letters, and then practice writing them over and over again. Rhythm & Writing with the Get Write Crew helps young learners get the repetition they need without getting bored. This product comes from Rhythm & Writing. It’s a multi-sensory approach to handwriting that really engages learners. I was eager to review it and see how it worked for my kindergartner. 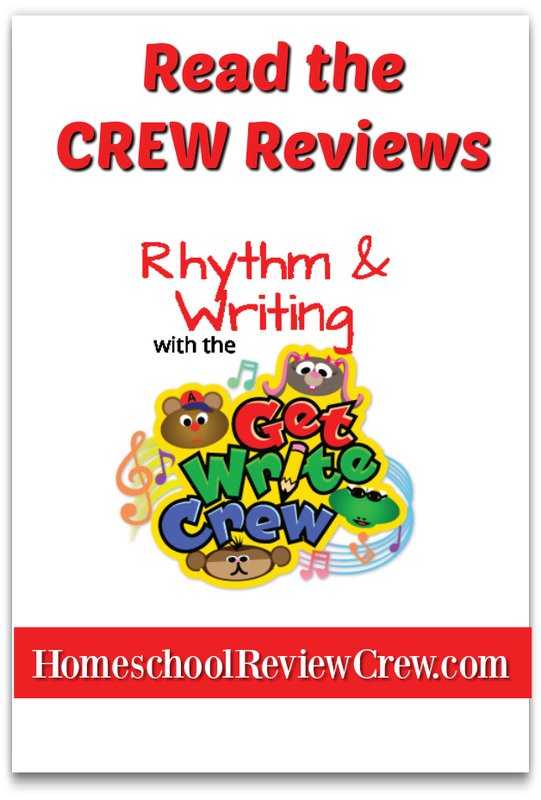 What Is Rhythm & Writing with the Get Write Crew? I received a spiral bound workbook, and access to online instructional videos. The book came with an overhead transparency sheet, allowing students to practice writing letters before they wrote in the book. I had my son watch the video and practice with the transparency one day. Then, the next day I had him write the letters in the book. This was a good method for him, as it cut the practicing time each session and allowed him to process what he learned. The videos used music and catchy rhymes to help students learn how to form each letter. Music is a great way to introduce concepts, as our brains easily remember music. The program included a pre-assessment quiz at the beginning of the book, and a post-assessment quiz at the end. I had my son complete the pre-assesment part, and I’m eager to compare it to the post one he will do after completing all the lessons. I’m sure there will be a dramatic difference in his handwriting ability. My son enjoyed following the adventures of the band. It’s another way to increase engagement with the lessons. While I love the idea of teaching handwriting through music, I didn’t care much for this music. It’s definitely different than the type of music we typically listen to. And it got stuck in my head easily! But, it was effective. My son was saying the lyrics as he wrote each letter. “Long line down and across, L” and “Up, around, across, around, and up: S” as he wrote. It’s very catchy. I appreciate that the letters aren’t grouped alphabetically, but rather by the line strokes needed to form the letter. I think this is a better way of teaching handwriting, as it allows maximum practice of the line shape and leads to mastery. I also liked the layout of the practice sheets. Students got to practice first one stroke and then the other. The prompts gradually faded out, going from tracing to dots to nothing. This allows a natural progression for kids and helps them gain confidence before they write on their own. The colored lines also helped – you start on green (because green means go!) and end on red. This program was a good fit for my active boy. He enjoyed practicing his letters. Apparently I’ve been out of the classroom for a while and forgotten that transparency sheets are for wet erase markers not dry erase ones! I got frustrated when I couldn’t wipe the dry erase off the sheet the first time. Then I remembered the difference. A baby wipe helped get the sheet ready to use again. My son did enjoy using the markers and cleaning the sheet afterwards. I appreciated the extra practice, and that it was different than just using a pencil. What Did Other Homeschooling Families Think? I was one of 38 reviewers for this product. To see what the other families thought, please click on the banner below.